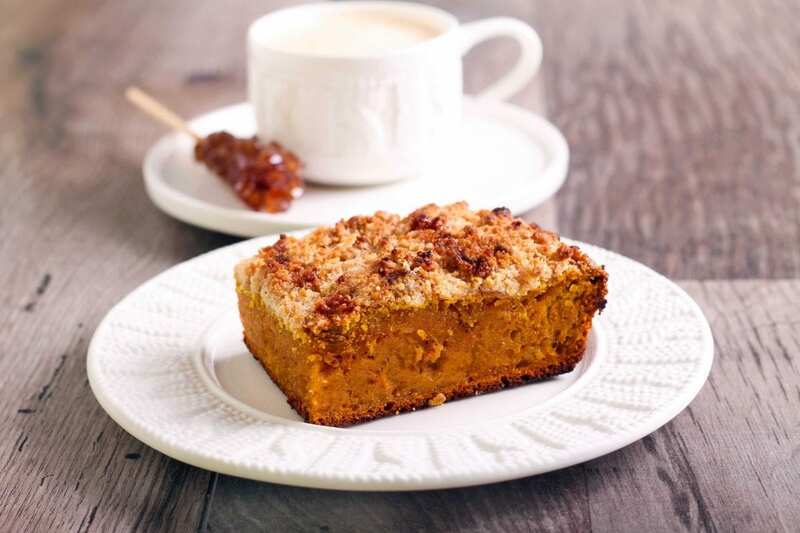 The perfect fall cake for breakfast or afternoon snack~ loaded with pumpkin and coated in cinnamon-sugar topping! It’ll be interesting to see what fall and winter is like here in San Diego. I’m assuming I won’t need my boots and scarves, that the leaves won’t change colors quite like they do in Utah, but you can still expect the same comforting fall recipes from me. Including pumpkin, of course. I don’t really know what makes a snack cake a snack cake, but this one is perfect for snacking or any time of day really. Make it for a quick breakfast before school or the perfect afternoon snack. My kids eat cinnamon and sugar on their toast almost daily, so when they went a little nuts for cinnamon-sugar topped cake. Preheat oven to 350. Lightly grease an 8X8 inch square pan, set aside. Whisk flours, baking powder, cinnamon, and nutmeg together in a small bowl. In a separate bowl, whisk sugar, pumpkin, egg, vanilla, and melted butter together. This snack cake looks delicious!! Pinned! This looks so good! Love the cinnamon sugar topping! Girl this looks perfect! Hope you’re feel welling and loving CA! Can this be made wo the whole wheat flour? Do you need to use 2 different flours? No, I just like to use some whole wheat flour! Boy This Recipe Looks Great! Just One Question, I Don’t Do Canned…Anything. Will Fresh Frozen Pumpkin Work? I Tend To Fear That My Fresh Pumpkin Puree Will Be Too Thin. I guess the only way to know is to experiment Nicole! I would think it would, but maybe start with a little less…watch the texture….then add a little more if needed! Good luck! Is there a high altitude variation? I’m at 7,000′ and my cake sank in the middle. It’s still delicious but I’d love to know if there’s a way to prevent this. Thanks!! Sounds like a great recipe. I like any thing pumpkin. Do you think you could also put rasins in the recipe? I haven’t tried but it’s a great idea!! I an intolerant to wheat..Can I use a mixture of oat and barley flour instead of white and wheat flour? Will the batter be to dense and not bake through? I haven’t tried it with other flours but I think it’s worth a shot! This was fantastic. I subbed half natural applesauce for half the butter and only used 3/4 c brown sugar. I cannot stop eating it. Thanks for such a great recipe!!! I know this recipe post is two years old, but I have this snack cake in the oven as I type this. I found this recipe on Pinterest when I was researching recipes that use up leftover pumpkin puree. This happened to use up all my pumpkin and I also happened to have all the other ingredients on hand too. Winner! I made minor changes. I greased the pan with coconut oil. I threw in some cardamom just because I think cardamom is underrated. I added 1/2 teaspoon of salt because it needs it. I threw in some ground flax seed too because it can’t hurt. I like that this uses whole wheat flour and that the recipe allows one to add or subtract and substitute ingredients. Thanks for posting. Pinned and made ! So glad!!! Thanks for sharing! !